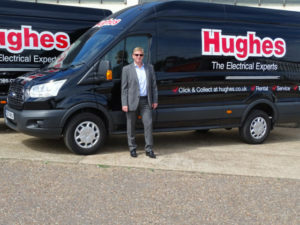 Specialist electrical retailer Hughes has rolled out driver coaching technology from Lightfoot across its fleet after seeing a dramatic improvement in driver behaviour during trials. The initial pilot of 10 vans and a car run by service director Mark Coleby found the technology reduced high-risk driver behaviour by 75% and led to fuel savings of almost 7%. As a result, Lightfoot’s system will be installed in the coming weeks across the Hughes fleet of 200 vans and 20 cars and is also set to bring about longer-term benefits including lower vehicle maintenance costs and reduced accident rates. Commenting on the trial, Coleby said: “As soon as we had the first report we could see the immediate improvement from our drivers. One of our worst drivers transformed overnight and now regularly rates as our second most efficient driver. Importantly, all our drivers bought into the concept of being better, smoother drivers; they like the way the device guides them, putting them in control and they enjoy the competitive aspect of Lightfoot.